Present address of THE CAMBRIDGE CENTER FOR MEDICAL & VETERINARY SCIENCES INC.
veterinary medicine as a General Veterinary Practitioner in its entirety. Ontario (CVO) - license no. 4796. Scientific Position: Assistant Professor of Experimental (Transplant) Surgery. -From June 19, 1991 to June 1997. - suppression of the harmful effect of warm and cold ischemia on stored organs prepared for transplantation (e.g. dehydration phenomenon, and/or Ca++ channel blockers). plasmapheresis, donor bone marrow, total body irradiation, splenectomy, etc. accelerated vascular/tissue rejection and to achieve a permanent accommodation of the xenograft. and/or veterinary and other related disciplines. d) Anesthesia: (1) sedation with e.g. meperidine or ketamine, acepromazine, atropine; (2) induction with e.g. felocell, felocine, felocell RC, felocell CVR, FelV, rabies. tissue water concentration in various organs. and sub-stages. For more information, please refer to the company's Phase One and Phase 2 of this project. 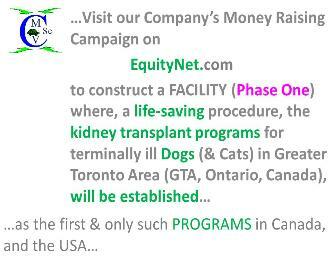 related to organ transplantation and/or general surgery (Canada). Medicine, Polish Academy of Sciences, Warsaw, Poland, 1975-1983). Research Center, Faculty of Medicine, Polish Academy of Sciences, Warsaw, Poland, 1980-1984. 4. Acting Chairman in the absence of the departmental chairman (on a few occasions in Poland and Kuwait). 5. Organizing the departmental research seminars (Poland, Kuwait). Veterinary College, OVC, University of Guelph, Guelph, Ontario, Canada, 1990-1997). 7. Evaluation of surgical procedures on behalf of the Animal Care Committee, University of Guelph, Ontario (Canada, 1995). 8. Writing Manual for the CCCM’s Faculty & Staff Position Interview(s), Guelph, ON (Canada, 1997). Medicine (internal use) Guelph, Ontario (Canada, 1997-1998). PHASE 2 (Canada, From November 1998 – to present). 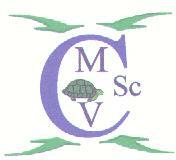 Cambridge Center for Medical &Veterinary Sciences Inc. (CMVS) (Canada, 1998-to present). & Veterinary Sciences Inc. (CMVS) (Canada, 2007-to present). & Regulations (Canada, 1999 - to present). the Canadian Government, as well (with 10 Chapters, Canada 2000-2001). web page - http://www.CCMVS.com (Canada, 2004 – to present). 16. Establishing on-line an-open International Clinical & Comparative Medical & Veterinary Sciences Journal – (Dr.
for up to 96 hrs (Principal investigator, grant from the University of Kuwait in the amount of C$4,400.00). Ontario, Canada in the amount of C$5,000.00). (Principal investigator, cooperation with Dr. E. Janzen, MRI Facility). 1992-1993 Guyton's sphere in rat treated with CCl4 (cooperation with Dr. E. Janzen, principal investigator). Ontario, Canada in the amount of C$13,000.00). Guelph, Ontario and Dr. W. Foster, Ottawa, Ontario, principal investigators). Medicine, University of Utrecht, Holland (3 days). reconstruction: clinical and experimental studies. pancreas preservation: past, present, and future. Veterinary College, University of Guelph, Ontario, Canada, February 14, (2 days). 2. Introduction to the Xenograft Transplantation Program at the University of Guelph. medicine and the benefit of companion animals (dog/cat). to deliver a seminar entitled: Xenotransplantation: Pig kidney to dog. influencing tissue resistance to cold ischemic injury. from April 1, 1976 to March 31, 1977. SUBJECT: "The effect of hyperosmolar solutions on the metabolism of liver cells". Medical Faculty, University of Groningen, Holland, for the period from January 1, 1984 to Jan. 31, 1985. University of Guelph, Guelph, Ontario, Canada, for the period from June 18, 1990 to June 18, 1991. SUBJECT: "Post/Flushing and Post/Ischemic Tissue Reperfusion Injury". dehydration during preservation and using low pH of flushing/preservation solutions". for up to 96 hours. RIG: University of Kuwait, Project No. MDT-177 (final report), 1987. Ontario K1A 0L2), March 1995.
the Polish Academy of Sciences, Warsaw, Poland. (Principal investigator - Dr. A. Deszkiewicz). Thesis for a Ph.D.
Transplantation. (Principal investigator - Dr. J. Czajkowski). Thesis for a Ph.D. degree completed in 1976. Transplantation, Centre of Experimental and Clinical Medicine of the Polish Academy of Sciences, Warsaw, Poland. (Principal investigator - Dr. H. Galkowska). Thesis for a Ph.D. degree completed in 1980. Hypokalemia". The Clinic of Angiopathy, Institute of Internal Diseases, Medical Academy of Warsaw, Poland. (Principal investigator - Dr. W. Grzesiuk). Thesis for a Ph.D. degree completed in 1981.
transplantation in Pigs /in Polish/. Anest Reanim Intens Terap 1976; 8(3): 317-327.
veins in dogs /in Polish/. Pamietnik 48 Zjazdu Towarzystwa Chirurgow Polskich 1976, p. 573. Polish/. Pamietnik 48 Zjazdu Towarzystwa Chirurgow Polskich 1976, p. 466-7. Polish/. Pamietnik 48 Zjazdu Towarzystwa Chirurgow Polskich 1976, p. 565-6.
effluent from hyperacutely rejected xenografts. Transplantation 1976; 22(5): 526-528. Med Pol 1978; 19(1-2): 53-57.
supporting function of the ischemically damaged kidney. Acta Med Pol 1978; 19(1-2): 35-42.
effluent from xenografts and inhibiting leukocyte migration. Arch Immunol Therap Exp 1978; 26: 1083-1086.
rejected xenografts. Transplantation Proceedings, 1979; 11(2): 1410.
survival using antilymphocyte globulin and donor antigen /in Polish/. Pol Przegl Chir 1980; 7a: 348-349. Lymphology, Avicenum Czechoslovak Medical Press, Prague, 1981, pp 133-135.
fistula. Arch Internat Physiol Biochim 1981; 89: 269-273.
tissues. Progress in Lymphology, Avicenum Czechoslovak Medical Press, Prague, 1982, pp 487-492.
to 90 minutes of warm ischemia by lidocaine pretreatment and low-dose dopamine infusion on revascularization. Advances in Experimental Medicine and Biology, 1987; 212: 291-297.
preservation in various solutions. Transplantation Proceedings, 1989; 21(1): 1372-1375. -fibre prosthesis. Eur Surg Res 1991; 23(1): 35-45. Polish/. 48th Congress of the Polish Surgical Society, Warsaw, 1976, Abstracts, p.180. Symposium on Preservation and Storage of Organ and Tissues for Transplantation, Warsaw, 1977. Radiological Society, Wroclaw 1977, Abstracts, p 29. Abstracts, Eur surg Res 1977; 9(1): 81. Dialysis and Transplant Association, Istanbul, 1978, Abstracts, p.196. Helsinki, Abstracts, Eur surg Res 1978; 10(1): 8-9.
xenografts. Congress of the International Transplantation Society, Rome, 1978. Research, Zakopane, 1979, Abstracts, p 111. Congress of Lymphology, Florence, 1979, Abstract, p 58. Polish/. 3rd Congress of Polish Cardiological Society, Poznan, 1979, Abstracts, p 75.
a hyperacute rejection model. 7th International Congress of Organs Transplantation, Baku, 1979. Brussels, Abstracts, Eur surg Res 1980; 12: 47-48.
dogs treated with ALG. VIII International Congress of the Transplantation Society, Boston, 1980.
organs. IV Symposium fur Experimentelle Urologie, Rostock-Warnemunde, 1981.
tissues. 8th International Congress of Lymphology, Montreal 1981, Abstract p 44. Congress of Experimental Surgery, Budapest, 1981, Abstracts, p 38. Congress, Debrecen, 1983, Abstracts, p 33. Polish Society of Surgery, Lodz, Poland, 1983, Proceedings pp 338-347. Surgical Research, Zurich, Abstracts, Eur surg Res 1984; 16(1): 76. Clinical Medicine, Rome, 1987, Abstracts, p 231. Rome, 1987, Abstracts, p 230. Pancreatic and Islet Transplantation, Stockholm, Sweden, 1988, Abstracts, p 94; Diabetes 1989; 38(S1): 241. Abstracts, p 149; Diabetes 1989; 38(S1): 273. Poster Abstract Book, p 90. * The Winner of the President's Award in Biological Section of MSC/SMC. Annual Meeting, Quebec City, Quebec, Canada, 1991, Clinical and Investigative Medicine 1991; 14(4): A138-861. Society Annual Meeting, Ottawa, Ontario, Canada, 1992, Clinical and Investigative Medicine 1992; 15(4): A152-957. the Microscopical Society of Canada, Toronto, Ontario, Canada, June 3-5, 1993. Proceedings 1993; 20: 170-171. September 9-11, 1993, Abstracts p 32, Clinical and Investigative Medicine 1993; 16(4): B139-863. Canada, September 9-11, 1993, Abstracts p 38, Clinical and Investigative Medicine 1993; 16(4): B140-864. Microscopical Society of Canada, Montreal, Quebec, Canada, June 12-15, 1994. Proceedings 1994; 21: 100-101. 58. Ruka MP, Plante C, Mallard BA, Foster RA, Cockshutt, Miller C, Abrams-Ogg ACG, Janzen EG, Butler DG. 30 Trachea reconstruction by implanted P.E.U. *** (a) Kidney auto-transplantation after warm (60, 90, and 120 min. in abdominal cavity) or cold (24 hrs. in 4°C) storage. into existence, supervised and fully financially sponsored by NOVARTIS Pharmaceutical Corporation. 1. Microvascular Surgery Training, Central Animal Laboratory, Medical Faculty, Groningen, Holland, April-May 1984. 2. Experimental Eye Surgery, Dr. Jan Worst Research Group, Groningen, Holland, March-July 1985. Nuclear Medicine at the Faculty of Medicine, Kuwait University Health Science Centre, Kuwait, October 11-15, 1986. 4. An International Symposium on Bio-ethics and Applied Ethnology, Montreal, Canada, August 15-16, 1987. Faculty of Medicine, Kuwait University, Kuwait, April 16-20, 1988. 6. An Educational Course on Tissue and Organ Transplantation, Sydney, Australia, August 13-14, 1988. 7. Second Kuwait International Symposium on Ophthalmology, Kuwait, February 3-7, 1989. University Laval, Quebec City, Canada, November 17, 1989.
organized by Dr. R. Guidoin, Institut de génie des matériaux -CNCR Boucherville, Montreal, Canada, September 29, 1989. Guelph, Guelph, Ontario, Canada, December, 1990. 11. "MRI in animal research for agriculture, veterinary medicine and biological models." Workshop organized by Dr. E.G. Janzen at the Department of Clinical Studies, OVC, University of Guelph, Guelph, Ontario, Canada, June 17, 1991. 14. First International Congress on Xenotransplantation, Minneapolis, Minnesota, USA, August 25-28, 1991. IL, USA, May 26, 1992. Towers, Chicago, IL, USA, May 29-30, 1992. 20. MRI - User - Seminar; Organized by Dr. E.G. Janzen, University of Guelph, Arboretum, 3rd December, 1992. Chicago, IL, USA, May 15, 1994. Towers, Chicago, IL, USA, May 18, 1994. 25. Fifth ASTS Postgraduate Course, Sheraton Chicago Hotel and Towers, Chicago, IL, USA, May 20-21, 1994. Ontario, Canada, April 5, 1995. Dr. John Prescott), at the Central Animal Facility, University of Guelph, Guelph, Ontario, Canada, April 25, 1995. 28. The 4th International Congress for Xenotransplantation, Nantes, France, September 7-11, 1997. Canada, July 30-August 1, 1999. Canada, Monday January 17, 2005. Standards: 8.5 x 11 inches or 216 mm x 279 mm). In other countries an A4 paper would be the equivalent of letter size paper used in Canada and the USA.